NATO is a crisis management organisation having over 18,000 troops and personnel around the world who undertake a wide range of military operations and missions, including peace building and peacekeeping. I had the privilege of sitting down with NATO’s Jamie Shea who agreed to offer his insight as to NATO’s importance for sustainable global security and stability and how NATO’s role positively impacts the United States. Mr. Shea has had a distinguished career with NATO. He started with NATO in 1980 and now holds the position of Deputy Assistant Secretary General for Emerging Security Challenges. In that role he assists in advising the Secretary General on the evolution of emerging security challenges, their potential impact on NATO’s security, and the development of relevant policies and action plans. He also facilitates the Emerging Security Challenges Division and coordinates NATO’s Science for Peace and Security Programme. Good morning Jamie. What a pleasure it is to sit down and have this conversation with you. Mrs. Lardner: Former United States Director of National Intelligence Brigadier General James L. Clapper recently described the current international security environment as “the most complex and diverse array of global threats” he has faced in his 53 year career. From NATO’s perspective what are the greatest global threats? Are these the same threats that America is facing? Dr. Shea: Certainly, we face one of the most uncertain outlooks for many decades. Challenges seem to be coming at us from all directions, and all the domains that NATO has traditionally operated in – such as sea, land, air, space and cyberspace – are now contested. For much of my NATO career, we have had the luxury of being able to focus all our efforts on one big issue in one place and at a time. For instance, we dealt with Bosnia in the early 1990s and then in the late 1990s with Kosovo. Then in the first decade of the 21st century, we focused for ten years on Afghanistan. Then, after 2011, on Libya. We probably thought back then that if we could solve these particular cases, the world as a whole would be much more secure; but I think we understand now that this is not the case. For example, just a few years ago, then-Director of the CIA General David Petraeus said that if we could solve the Arab-Israeli dispute, the Middle East would be much more stable. Today when we look at what is happening in Syria, Iraq, Yemen or Libya, it would be very difficult to make this claim. So today, NATO has to be able, in the words of Lyndon B. Johnson “to walk and to chew gum at the same time”. We have to address simultaneously the return of a rather traditional threat from Russian military power in eastern Europe and go back to collective defence like we did during the Cold War, while concentrating at the same time on how we pacify and stabilize this vast area of turbulence to the south, which extends all the way from Maghreb in Northern Africa to the Middle East and the Persian Gulf. The problem here is that there is whole series of failed or failing states and most are fragile, with only a few islands of democracy and decent governance. At the same time, the instability is not only coming from large groups like ISIL or Al Qaeda, but from literally thousands of proxies and sub-state actors. In this environment, sorting out who is a friend and who is a foe is not easy and the contours can change very quickly as well. Apart from terrorism, the turmoil in the south may not present an immediate security threat to Europe as many of the forces in the region are currently focusing on fighting each other. Yet we increasingly also understand that we can not stand idly by and watch the wars burn, as chaos in a place like Syria or Libya can produce hundreds of thousands of refugees heading towards Europe and this can soon produce a migration crisis that could de-stabilize the European Union. So the greatest threat to NATO is all of this uncertainty and instability which looks as if it could get worse before becoming better. We have to deal with traditional military threats which are coming back with more countries around the world acquiring sophisticated technology and ballistic missiles, such as Iran, and the fact that those states as well as terrorist organizations or proxy groups can also inflict disruption on us by resorting to other instruments, such as disabling cyber attacks. Even ISIL, while not being a state, has developed chemical weapons, driverless suicide cars and drones capable of dropping bombs. So the old difference between the strong and the weak is fading. Simply put, the bad actors have more capabilities to do us harm than in the past, because if they can not defeat our military forces (at the moment) they can still de-stabilize us and do us harm by attacking our societies, undermining our election campaigns, sabotaging our infrastructure or stopping our societies moving through paralyzing cyber attacks. Certainly when I think of the main worries, such as terrorism, cyber and ballistic missile and nuclear proliferation, I don’t see that there is any difference in the threat level between Europe and the United States. Mrs. Lardner: You were with NATO on 9/11, a date etched in the minds of all Americans. While the attack occurred on American soil, how and why did NATO become involved? Dr. Shea: 9/11 was just a big a shock to Europeans as it was to Americans. The day after, the French newspaper Le Monde even ran a headline saying “We are all Americans now”. Citizens of over 60 countries were killed in the World Trade Center and we in Europe really felt that this was not just an attack on the United States, but on western civilization and our liberal democratic values. There was a real sense that it could so easily have happened here, for instance to the London Stock Exchange or to the Louvre museum in Paris with an equal number of nationalities being involved. So it was immediately clear that this was not just a one-off attack but the hallmark of a new form of terrorism against NATO countries by a group – Al Qaeda – that would be far more extreme and difficult to overcome than what we had seen before. What hit America on 9/11 would hit Europe soon afterwards and indeed it has with mass killings in Paris, Brussels, Nice and most recently Berlin. As a result, NATO wanted very much on 9/11 to demonstrate its solidarity with the United States and its sense that the attack was against all of us. The best way to do this was by invoking Article 5 of the Washington Treaty which says that an armed attack on one could be considered as an attack on all and that we would respond together. 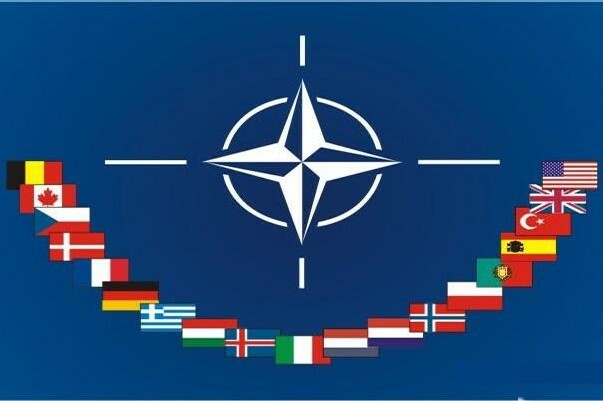 Now it is certainly true that when NATO’s founding fathers devised Article 5, they were thinking of an attack on Europe by the Soviet Union and the United States coming to the rescue of Europe, as in the two World Wars. Yet by invoking Article 5 to help the United States, I think the Europeans were also showing that they realized the world has changed and that Collective Defence can not only apply to traditional scenarios of Russian tanks crossing NATO’s borders. We have to think more creatively and use Article 5 to respond to other types of aggression. At our Wales Summit in 2014, we went a step in this direction by declaring that cyber attacks could be considered also as an Article 5 instance of Collective Defence, if they inflict enough damage on one of our Allies. So in this sense, 9/11 was an important transformational step for NATO. It also led to NATO Allies joining the United States in Afghanistan to bring an end to the Taliban regime and help stabilize the country thereafter. The fact that all the Allies sent troops to this mission and kept them there for the best part of a decade, shows this sense of solidarity with the United States. To my mind it also shows that NATO is not a one-way Alliance, in which the United States does everything for Europe and nothing in return. By fighting in Afghanistan, sending forces to Iraq and now joining the Anti-ISIL Coalition, European and Canadian Allies have shown the United States that NATO is a two-way street. Mrs. Lardner: Is this the reason for NATO’s presence in the Middle East and North Africa or MENA? Would it be fair to say that NATO’s activities support the global war on terrorism? Was this a new role for NATO and did NATO change after 9/11? 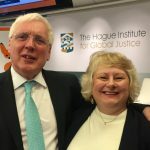 Dr. Shea: Certainly, and as I said in reply to the previous question, NATO solidarity is an important reason why the Allies are engaged in the Middle East and North Africa and 9/11 was an important turning point when we realized that threats from the south could be as dangerous and urgent as dealing with a resurgent Russia in eastern Europe. Yet the Allies also realize that it is not just NATO solidarity or a spirit of generosity towards each other. They also face real threats from the south and they have a vital security interest in responding to them. That is why France has deployed significant forces in Mali and the Central African Republic. Or Turkey has deployed forces on its southern border to counter Kurdish extremism as well as ISIL. It is also why the European Union is running a number of training and capacity-building programmes in North Africa and has also deployed ships to the Central Mediterranean to cope with the flow of migrants out of Libya into Italy. NATO is also helping the EU with this mission and NATO has also deployed ships in the Eastern Aegean to help the EU’s border management agency, Frontex, deal with the migrant flow into Greece from Turkey. So if your image of the global war on terrorism is one of drone strikes and Special Forces operations against remote Al Qaeda units in Yemen or Somalia, then this is not the NATO role. However if, as I do, you can see the global war on terrorism as requiring a broad spectrum of activities, not just to kill individual terrorists, but to quash terrorism itself in the long run, then NATO is indeed a key player. I mentioned already the presence of over 100,000 NATO forces in Afghanistan for ten years as part of the international security assistance force. Today, NATO has over 10,000 personnel in Afghanistan training the Afghan Army so that it can handle security by itself. Many Europeans, as well as Americans and Canadians lost their lives in this effort. NATO has also recently established a training programme in Baghdad to help Iraqi forces deal with explosive devices. We have training programmes also in Jordan and Tunisia and we have offered to assist Libya with training and restructuring its militias and armed forces. A stable Libya will obviously be a key facet in the long run of any successful effort to curtail terrorism given that is where ISIL is seeking to relocate after Raqqa and Mosul. NATO is also using its AWACS aircraft as part of the US-led Anti-ISIL Coalition, in which all Allies are participating. So it may not be possible to defeat terrorism only with NATO but I would argue that it would be equally impossible wholly without NATO. Mrs. Lardner: Americans, perhaps as many as 79%, fear terrorist attacks. Would you agree that one of the key ways to eradicate terrorism is to provide sustainable peace by fostering democracy, security sector reform, education, a justice system, and even water justice? Let me rephrase that – by creating greater equality does the global community decrease the number of people who can be recruited by ISIL? What role does NATO play in this process? Dr. Shea: I understand that the long-term solution to terrorism is to create more jobs and better living standards throughout the Middle East and North Africa, as well as in other parts of the world, such as Indonesia and the Philippines, where terrorism has also taken root. The British Prime-Minister Tony Blair used to say that we must be tough on crime, but also tough on the causes of crime. I would say the same of terrorism. The starting point here is to bring an end to the wars in Syria, Iraq, Libya and Yemen, as these conflicts are obviously radicalizing many people and driving unemployed young men and women into the arms of extremist groups. But we also have to be realistic. Reconstructing North Africa and the Middle East will take generations and cost billions of dollars. The World Bank recently estimated that the cost of re-building Syria alone would be well in excess of 120 billion dollars and we are nowhere near the end of the conflict and further destruction in that country yet. So this is going to be a long-term enterprise, although I take the point that we must do a much better job of bringing things like democracy programmes, development aid, education, justice, climate change and military security into much better synergy than we have managed in Iraq or Afghanistan in the past. In Afghanistan, we were spending 10 dollars on the military for every dollar on development and not coordinating our efforts very successfully. This is clearly one reason why progress there has proved so slow. At the same time, we obviously need to ensure that Muslims living in North America or Europe feel welcome and integrated and not stigmatized as aliens on account of their religious beliefs or customs. There is no going back to mono-ethnic or mono-religious societies and indeed diversity is a source of strength and innovation. Where would the United States be today without its generations of immigrants? Europe too needs immigration to sustain its prosperity in the wake of demographic decline of many of its populations. So we need hard-headed policies to build successful multi-ethnic societies in which the nihilistic message of ISIL or Al Qaeda would be as ridiculous to young Muslims or even some Christians who have converted to radical Islam as the statement that the earth is flat and that you can fall off the edge. I also want to add one further note of caution. Terrorism is not just caused by poverty or despair. History is full of terrorists and anarchists who came from the aristocracy and enjoyed all the privileges of society. The terrorists of 9/11 were middle class and educated. History teaches us that there are always going to be misfits and extremists who are not willing or able to accept the liberal, tolerant values with which our societies operate but who are nostalgic for a form of totalitarianism. So we will always need a good security organization to identify and deal with these individuals. NATO does not have a role to play in immigration policy or de-radicalization programmes, which are best left to national governments or competent organizations in this area such as the European Union or the United Nations. Everyone has their comparative advantages and strengths and in the case of NATO, its added value is in the exchange of intelligence and information on the terrorist threat and working with partners to build up their capacity to deal with terrorist groups on their territories. The key thing is that we all fit together as part of an overall strategy that is not working at cross purposes but helping to achieve lasting success. Mrs. Lardner: One of the functions undertaken by NATO, along with the United Nations, is nation building to promote democratization. Can you tell me a little bit about what is involved in nation building? Dr. Shea: Nation building is obviously a never-ending process. When do we ever stop trying to perfect our democracies or build better functioning nations? Yet in the sense of NATO missions in the Balkans or Afghanistan, nation building is about putting the basics in place in a way that is self-sustaining and does not require NATO to constantly re-intervene because as soon as it departs, political agreements or institutions collapse. So we call this a self-sustaining piece. What are the elements? In the first place, a security environment, which allows people to make investments and set up businesses in the knowledge that these are not going to be destroyed from one day to the next. Otherwise the economy does not re-start. Another is making sure that the basic institutions of governments are in place, like the executive, the judiciary, a functioning parliament. Another element is disarming local militias so that they can not disrupt the peace process and training the national forces to manage security by themselves. Other things like law to protect religious minorities or media freedoms are also important, as corruption always thrives where there is no free press to hold it in check. None of this means trying to build Switzerland in Afghanistan, which would be an impossible task but to have something which the military often refer to “Afghanistan good enough”. That means a country which is able to avoid doing violence to itself or its neighbours and to get along on the basis of a social compact, even if the locals may do things in “the Afghan way” or “the Iraqi way”, according to their local customs and culture, rather than according to a “one size fits all” western model. This is not mission impossible as is sometimes claimed but we have to recognize that progress requires a great deal of perseverance and a good strategy. We live in a world which is focused on short-term results and quick fixes and this does not work in places like Iraq or Afghanistan. Mrs. Lardner: NATO has been involved in this process in Afghanistan since August 2003. How did NATO become involved in Afghanistan? Could you highlight some of NATO’s activities in Afghanistan? Dr. Shea: NATO began its ISAF mission in Afghanistan in 2003, to demonstrate solidarity with the United States after the 9/11 attacks and in recognition that the Taliban-Al Qaeda regime in Afghanistan at the time was as much a threat to Europeans as to the United States. NATO also decided to assist a UN mission based on German and Dutch troops that was already in theatre but which could benefit from the organization, command and control that an organization like NATO could provide. For the first ten years, NATO’s ISAF mission was focused on providing security throughout the country based on four regional headquarters. NATO also began to train and equip the Afghan Army in order to be able to take over from ISAF and it developed a Cooperation and Partnership programme with Afghanistan to help with long-term, such as the Afghan security concept and reorganization of its Ministry of Defence. This cooperation programme also included some civilian activities, such as the Silk-Afghanistan programme, led by NATO’s Science for Peace and Security programme, which provided internet connectivity to Afghanistan’s many universities. This was a great help in connecting Afghanistan’s younger generation to the outside world. NATO also ran a series of provincial reconstruction teams that provided military support to development agencies working on projects such as agriculture or schools. After 2014, ISAF came to an end and NATO launched a new mission called Resolute Support, where NATO and many of its partner countries work on training the Afghan national army. 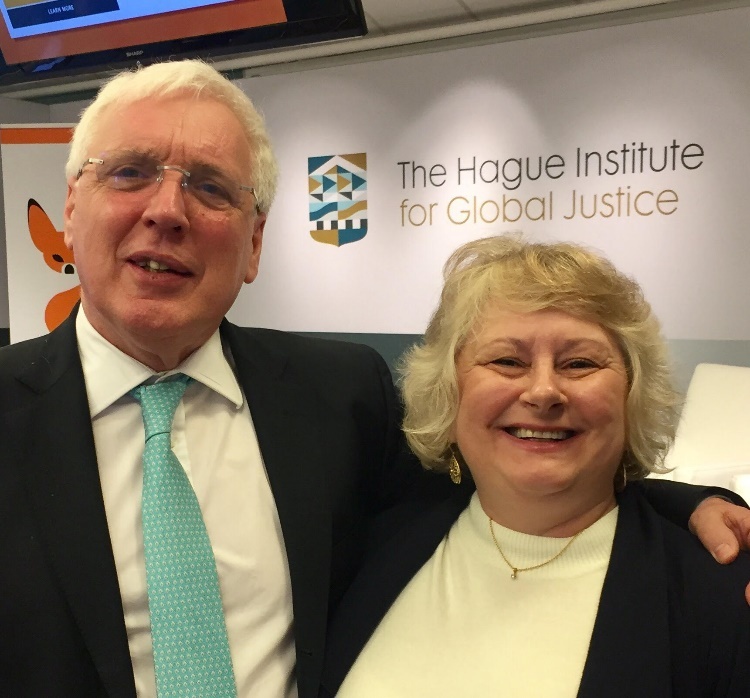 Mrs. Lardner: There is a global initiative – Combatting Violent Extremism – spearheaded by the United States Department of State that encompasses over 100 countries, 20 multilateral bodies, and 400 civil society organizations. Is NATO participating in this program? Dr. Shea: Not as such, as NATO is not the best instrument to combat violent extremism, as I hope I explained in an earlier answer. But representatives from the United States State Department and the United Nations and also the European Union visit NATO regularly to brief NATO’s ambassadors on their activities, so that we are aware of what is happening and can make sure that their own efforts to fight terrorism fit into this overall framework. Mrs. Lardner: The North Korean diplomat who recently defected confirmed that North Korea is intent on developing an intercontinental ballistic missile mounted with a nuclear warhead capable of striking California. In the event that such a catastrophe occurred, would NATO come to the United States defense under Article 5? Dr. Shea: Certainly, that possibility is there, as the duty of NATO is to protect the United States as much as for the United States to protect its European Allies. This said, the consequences for North Korea to use a nuclear warhead against the United States would be truly catastrophic to North Korea, as has been made clear just last week when the new US Defence Secretary James Mattis, visited South Korea. The United States also has at its disposal all the means necessary to respond to such an attack and the North Korean leadership is undoubtedly fully aware of this, notwithstanding its track record of provocations and irresponsible behaviour. 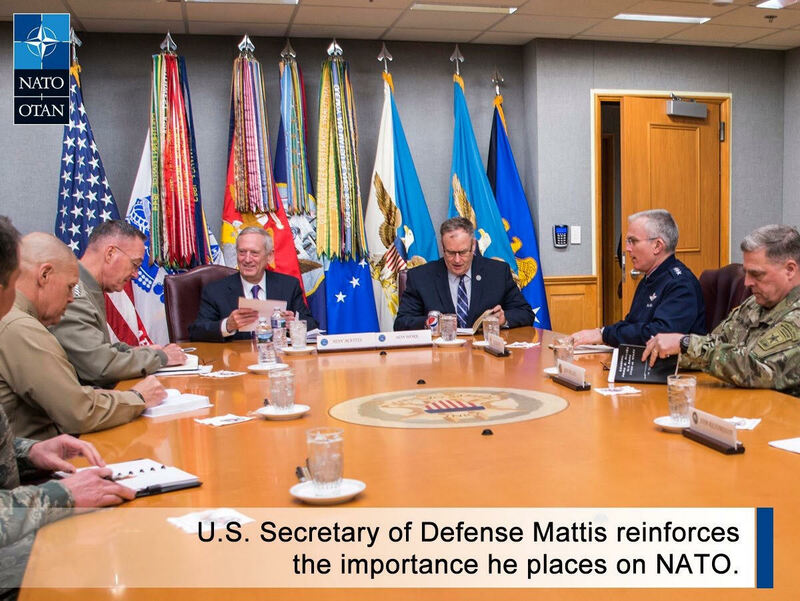 Mrs. Lardner: On January 21st the day after being confirmed Secretary of Defense General James Mattis contacted NATO allies to assure them of continued U.S. involvement. The Executive Order signed January 28th excludes General Mattis, along with the other Joint Chiefs of Staff from the newly formed Principals Committee. At this time NATO membership is subject to auto renewal with any member state able to issue a notice of denunciation which is a one year notice of intent to exit NATO. It is my understanding that it is possible that under Article 13 that Mr. Trump could issue an executive order that would serve as the requisite notice of denunciation without any action by Congress. Has concern been expressed by NATO member nations? Dr. Shea: Yes, it is possible to withdraw from NATO after one year’s notice, but no state has ever done so and indeed many European countries are seeking to join NATO, which is certainly a vote of confidence in NATO’s continuing utility. NATO is by far the most successful Alliance in history and has given Europe and North America a period of peace and prosperity that they have never known before. It is also an Alliance in which everyone benefits, as Allies are responsive to each other’s security concerns. NATO also operates by consensus which means that everyone has a vote and prospective veto over decisions. So their national interests cannot be ignored. For all these reasons, NATO represents the gold standard in international security and I am tempted to say, as Voltaire did about God, that if it didn’t exist we would have to invent it. So although Allies may have issues with each other from time to time regarding defence budgets and burden-sharing, the advantages of staying in the Alliance vis-à-vis the disadvantage of finding oneself alone in an increasingly disorderly and dangerous world, are such that I do not see any Ally leaving the Alliance. Look at France, which was outside NATO’s military command structure for over 40 years but decided to return in 2009. Mrs. Lardner: One of Mr. Trump’s criticisms is that the United States is one of five states that is in compliance with the obligation to commit a minimum of two per cent of their Gross Domestic Product (GDP) to spending on defence. Just so my readers understand, that 2% is not paid to NATO, it represents what each member nation must invest in its own defence spending? Hasn’t the United States over the last decade consistently invested more than 2% in building up its military capabilities? Dr. Shea: It is certainly true that the United States has by far the highest level of defence spending among the Allies and spends a higher percentage of its GDP on defence than the greatest majority of the other Allies. But there are historical reasons for this. The United States is a super power with global responsibilities. It has troops and bases in Asia, the Pacific, Africa, the Middle East and North America. It has security obligations in many other parts of the world in addition to Europe, for instance its alliances with Japan and South Korea or Australia. So clearly the United States, given its global responsibilities, requires a much greater degree of military capability than the Europeans who do not have defence commitments outside NATO, except for some bilateral arrangements of France and the United Kingdom. This said, President Trump has a point when he says that the Allies have to meet the 2% target. This is not new, as the Obama administration was making this point just as forcefully. And it was indeed under the previous administration that the 2% objective was publicly agreed as an Allied commitment. It is true that at the moment, only four European Allies meet the 2% target but 18 have now come up with plans to move progressively towards this target and have announced many new defence investments and projects. France has halted troop cuts and Germany has just announced a substantial modernization programme, including short-range air defence. I expect the other Allies also to announce plans to meet the 2% target before NATO holds it first Summit with President Trump in May. So what counts is that we have turned the corner and that Allies, recognizing that the world has become a more dangerous place, are now re-investing in their defence. But don’t forget, NATO’s job is not only to persuade its members to spend more but also to spend wisely and on things that can really benefit NATO. Spending more to waste more is not the answer. So it is important that Europeans in particular get more value for money through cooperating. For instance Europeans currently have four times as many weapons systems as the United States in their inventories and this represents massive duplication. Mrs. Lardner: However, hasn’t there been criticism leveled at the United States for not paying the United Nations $3 billion owed for dues and peacekeeping operations? 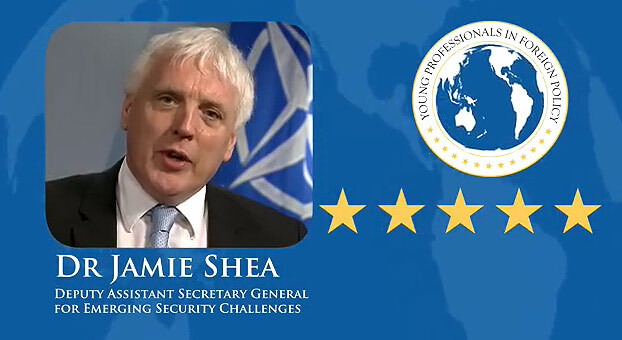 Dr. Shea: I would hope – and expect – that the United States will pay its dues to the United Nations. The cost of all UN peacekeeping operations is about 8 billion dollars a year for 16 different missions. When you compare this figure to what NATO was spending in one year just on Afghanistan, then this is a very modest sum; and the cost of a UN Peacekeeper is only about 20% of the cost of a NATO soldier. We need the UN to do missions which for political or other reasons would be difficult for the western countries to engage in and I think we have to recognize that the UN has improved its peacekeeping and learned many difficult lessons from the past. Today, three out of five UN Blue Helmet missions help countries to stabilize so that they do not relapse back into conflict. It is not a perfect record by any means but we the western countries are not necessarily better. And I think that the world would be a much more violent place if we did not have the UN to establish the rules of proper international behaviour and bring war criminals to account. Also, remember that the European Union collectively pays a higher contribution to the United Nations than the United States, although I do take the point that others such as China or Russia or some of the emerging economies do need to pay a fairer contribution. Mrs. Lardner: Russia’s relationship with the West has been less than positive since the illegal annexation of Crimea. So far, we do not have any idea where Mr. Trump is headed save he has reserved comment on whether the United States would roll back economic sanctions. How important are economic sanctions in showing unity amongst NATO member nations? Dr. Shea: Economic sanctions are important because over time they do change the behaviour of recalcitrant states. Look at Iran or Libya, which agreed to freeze or give up weapons programmes, mainly because international sanctions were applied to them. Russia is also feeling the effect of the sanctions imposed on it following its illegal annexation of Crimea. But sanctions require unity and perseverance, which is why they were successful vis-à-vis Libya and Iran. The alternative to sanctions is either appeasement and giving in, which only stores up more trouble later on, or using military force with all of its unforeseeable consequences. So sanctions are not perfect but are probably the best instrument that we have. But we must be patient and give them time to work. Mrs. Lardner: Why should Americans care about what happened in Crimea and what’s happening in Ukraine and Eastern Europe? Dr. Shea: Churchill famously said that the aggressor is never satisfied. Every time he is appeased, he sees this as weakness and simply comes back with more and more exorbitant demands. So if Russia is allowed to violate international law in Ukraine with impunity, it will believe it can act in the same way elsewhere in the world. And in ways that directly threaten US interests. Think of Russia’s current role in Syria and the wider Middle East, its build-up of nuclear missiles, its cyber attacks against the United States elections, or its intimidating actions against US ships. At the same time, the values that the US represents are those of international law and responsible behaviour in international relations and respect for other states and peoples. It is on this basis rather than naked power that America’s prosperity and interests lie. The US is still very much the global leader for the liberal international system and in a world in which these values are increasingly being challenged by states like Russia, China, Iran, North Korea or others, it is a source of inspiration to millions of people across the global that the United States is still willing and able to uphold these values. Power is after all the ability to inspire and lead others as much as an issue of tanks, missiles and defence budgets. Mrs. Lardner: What threats does Russia pose to the West, such as espionage, cyber warfare, conventional warfare, proxies, nuclear armament and misinformation? Dr. Shea: Regrettably, all of the above. Where Russia is different vis-à-vis the old Soviet Union, is that it now has a much stronger foothold within our western democracies, in terms of media ownership, influence on populist parties, cyber instruments, energy relationships and other business deals. All of this gives Russia a much larger keyboard on which to play and it tends to use all of these instruments and to see in each particular case which one can produce the most confusion and destabilization. For instance in Ukraine, Russia tried fake humanitarian operations and when these did not work, sent in the “little green men” disguised as local soldiers. This said, the key thing is to expose Russia’s behaviour quickly and effectively by clamping down on fake news and attributing cyber operations. We also need to build a strong military defence because the key thing is preventing Russia from trying to convert a hybrid warfare-type of attack into an actual military attack. We can recover quickly from the first type but unfortunately not so quickly from the second type. Mrs. Lardner: Would you not agree Jamie that the mere existence of NATO is a deterrent to Russian aggressions involving any NATO member nation? Dr. Shea: Yes I would. I remember well during the Kosovo campaign in 1999 that what finally drove the Serb dictator Milosevic to the negotiating table was not so much the pressure of NATO’s air campaign (which was quite limited and progressive) but his inability to break up the Alliance. After 78 days, Milosevic realized that NATO was determined to see the mission through and that the more he delayed withdrawing his forces from Kosovo, the worse the final outcome for him would be. So yes, unity is the best deterrent message, so as to leave a potential aggressor in no doubt about NATO’s resolve and not to create the ambiguities or misunderstandings that could lead to fatal miscalculations. But we must also remember Frederick the Great of Prussia who famously said that diplomacy without arms is like music without instruments. So unity backed up with a credible defence is even better. Mrs. Lardner: While some call for expanded missile defenses to bolster assurances to NATO partners, others call for pausing the program before a new site is built in Poland as a means to deescalate tensions with Russia. Has General Mattis or his predecessor Ashton Carter indicated whether the U.S. should continue to expand NATO European missile defenses? Dr. Shea: For the time being, NATO’s missile defence goes ahead and we have made it clear on numerous occasions that missile defence is not directed against Russia and does not have the technical capabilities to shoot down Russia’s missiles. It is a system designed to deal with threats from the south and countries like Iran who are continuing to test and modernize their ballistic missiles. So there are no plans at the moment to stop this system before it is complete, so that we are able to ensure the defence of NATO’s territory and populations. But we are talking to Russia in the NATO-Russia Council and have had many discussions with Russia in the past, so that Russia can understand that this system is not a threat to its own security. It is after all, wholly defensive. Mrs. Lardner: Jamie, compared to the Cold War Era, is NATO busier today? Dr. Shea: Undoubtedly yes. We are conducting many more activities in many more parts of the world and with a network of over 40 partners we never had during the Cold War. But busy is not the main point. Ernest Hemingway famously said that there is a difference between activism and activity. So the key point is to make sure that our activities produce real, measurable results. Mrs. Lardner: In terms of NATO leadership America has played a pivotal role. Most Americans don’t realize that NATO is headquartered in both Brussels, Belgium and Annapolis, Maryland. How many Americans are employed by NATO? Dr. Shea: It is difficult to give a precise number, as Americans are employed in a national capacity, at the US Mission to NATO or the Office of the US Military Representative, as well as in an international role at the two NATO Strategic Commands (SHAPE at Mons and Allied Command Transformation at Norfolk, Virginia, USA), as well as throughout the NATO command structure with its many headquarters in Germany, Italy, Turkey, etc. So I imagine the number would add up to several thousand but this figure of course has to be compared to the 126,000 US troops stationed in Europe during the Cold War, and a much smaller number of about 5,000 US troops who are participating in NATO’s Collective Defence in Poland today. Also remember that the US European Command, EUCOM, in Stuttgart, Germany, is a US national command and not part of NATO. Europeans are always willing to welcome as many Americans as we can have as the transatlantic link is the life blood of the Alliance and this is expressed first and foremost in the ability of Americans, Canadians and Europeans to work together and from the highest to the lowest levels of NATO. Mrs. Lardner: NATO’s Supreme Allied Commander of Allied Command Operations in Europe is the title held by the most senior commander within certain multinational military alliances. Hasn’t this position always been filled by a five star American general or admiral? Dr. Shea: Yes it has, although the majority have been four stars. Having the United States provide the Supreme Allied Commander has been since the time of General Eisenhower the very symbol of the US commitment to Europe and the fact that SACEUR commands both NATO as well as US forces in Europe also symbolizes that strong link. On the other hand, it is positive that the Europeans are now providing the second NATO Supreme Command at Allied Command Transformation in Norfolk, Virginia. Having an American in Europe and a European in America again demonstrates our integrated approach and interoperability throughout all the NATO structures. Cynthia M. Lardner is an American journalist living in The Hague writing about geopolitics for Tuck Magazine and E – The Magazine for Today’s Executive Female Executive and the International Policy Digest. Her blogs are read in over 37 countries. As a thought leader in the area of foreign policy, her philosophy is to collectively influence conscious global thinking. Ms. Lardner holds degrees in journalism, law, and counseling psychology.